I forgot to tell you what I got in my HORSE BOX last month!! OK so I love grab bags and surprises. I do. I mean I REALLY LOVE them. So, it wasn’t a stretch for me to sign up for A HORSE BOX. 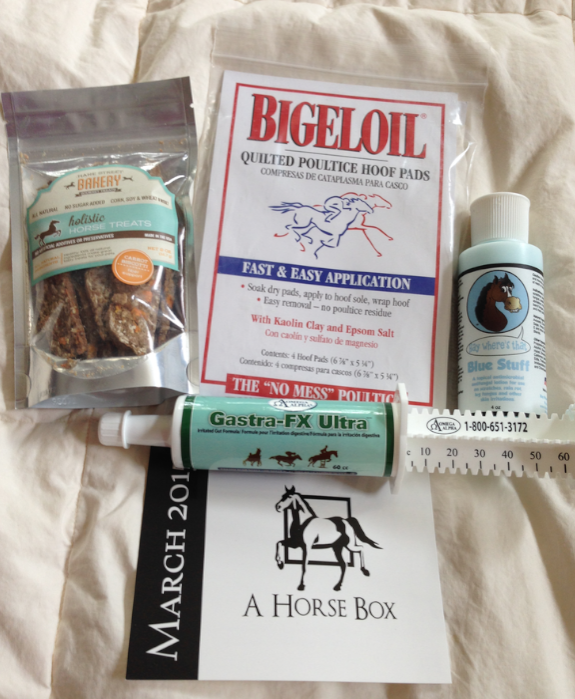 This is the service that sends a little box of equine product joy to your door every month! I was a bad girl in that I threw out the box and only have the contents to show you which are sitting on my bed. —A HorseBox sanitizer spray which is in my purse that is in my car. Otherwise, this is what I received! Mane Street Bakery holistic horse treats Biscotti cookies, Bigeloil quilted poultice hoof pads, Hay, That Blue Stuff (for rain rot) and Gastra-FX Ultra by Omega Alpha. 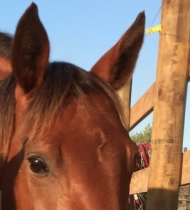 —Hay, Where’s the Blue Stuff: I haven’t used this yet because none of my horses have rain rot because it hasn’t rained much. But I have heard that it works well for rain rot and also for hot spots on dogs. I also signed up for a Tack Box! Again, I used a few items before I took the photo… my bad. 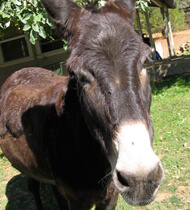 –I received A HORSE BOX travel bag that is now in my car to carry groceries. –I received another sanitizer spray and a purple curry comb that is now really dirty and Tess’ favorite new grooming tool. My A Horse Box Tack Box. I also received a lovely travel bag, a sanitizer spray and a purple curry comb that Tess loves. My bad that those items were in use elsewhere when I took this photos. 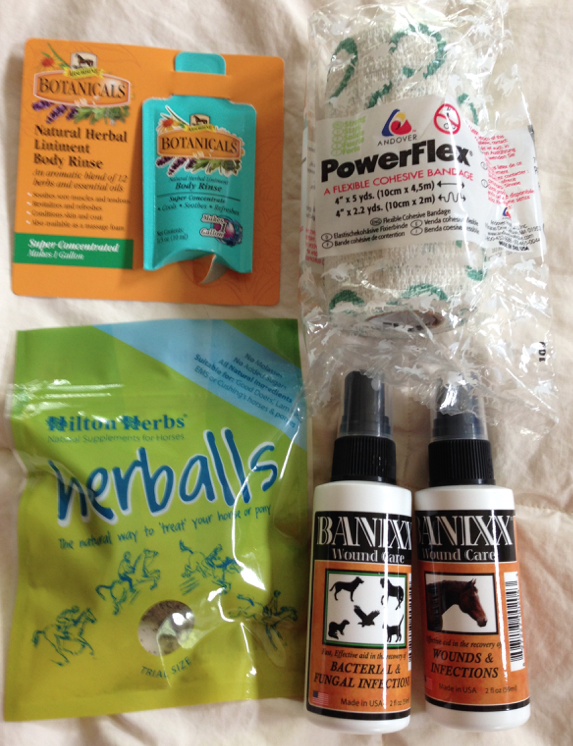 –Banixx Wounds and Infection Spray: I used this inside of Tess’ hoof… and I must say that it did keep it clean. I’m not sure it is better than Equisilver, but it is always good to trade off anti-bacterials just in case an immunity is created… so I’ll use both. It is relatively inexpensive, which I like. 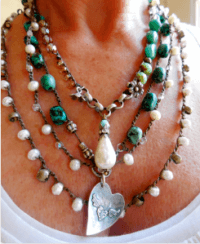 –Powerflex Wrap: I use this already, daily. So, it was gone instantly! —Botanicals Liniment Rinse: I haven’t used this, but it has a nice fragrance. 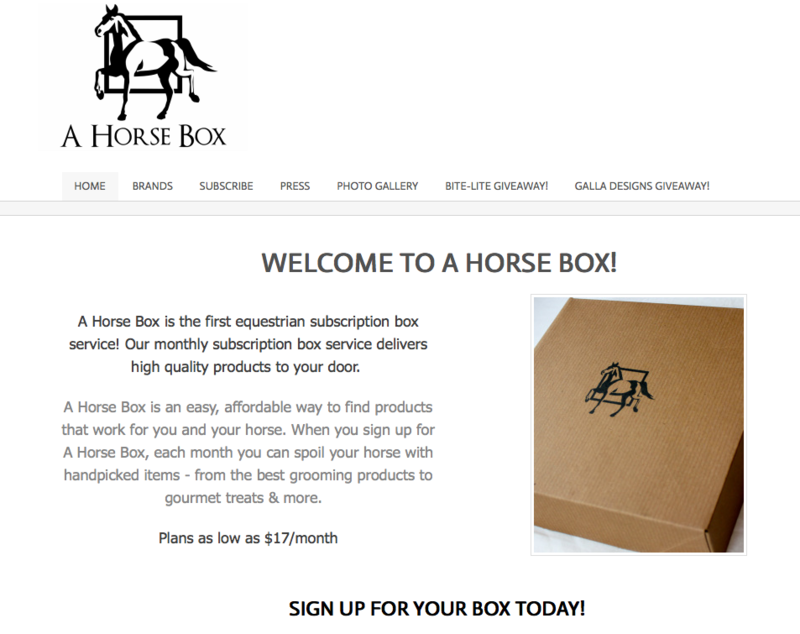 Here is where you sign up for your Horse Box! Bite-Lite’s® new horsefly trap uses a unique single legged frame, large black inflatable ball, and green conical hood to trick the female horsefly into finding the ball’s infrared signature after being heated by the sun. After landing on the ball to “feed” and failing to get its intended blood meal, the female will fly vertically, its normal flight path, into the green plastic conical hood and get trapped into the plastic collection bin. Perfect for commercial horse stable yards, cattle farms, campgrounds, meadows, golf courses, gardens, ponds, swimming pools, water parks, state parks, and any other sunny locations where female horseflies are a nuisance. Contest open to U.S. residents. As I search for a saddle to fit my mare, Beautiful Girl (TWH, high wither/wide shoulder), I wanted to remind myself all the points of saddle fitting. 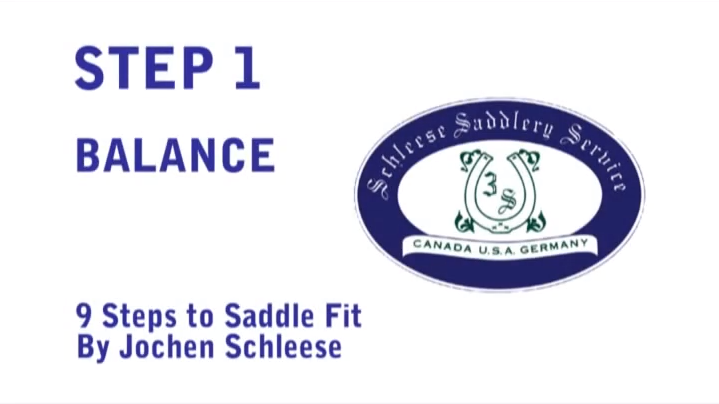 So, I started Googling it and ran across this lovely educational link, “The 9 Points of Saddle Fit – Guidelines for Optimal Fit to Protect your Horse!” with videos (a plus) on the Schleese Saddle page. I was so impressed with the ease of these learning tools, I thought I’d pass them onto you – in two parts. Don’t think just because you ride Western that this doesn’t apply. The principles are the same! Lifted directly from the Schleese Saddle Fitting Page linked here. Click on each title link to read the full version… please revisit our page monthly to access new links OR visit our Schleese Educational YouTube Channel and watch all the videos at your leisure. Balance: The center of the saddle (seat area) should be parallel to the ground while on the horse’s back. Click on the video to hear why balance is important. 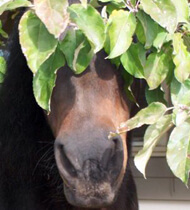 Is your horse lacking in its performance? You may be faced with a Saddle Balance issue. 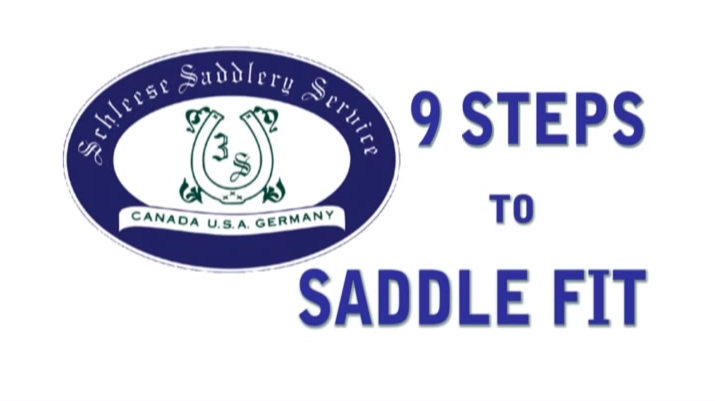 Watch this informative video for some saddle fit tips on Balance that may help you! 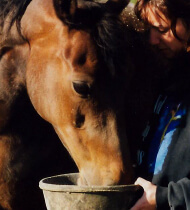 Do you feel you are struggling to get balanced in the saddle and are feeling tipped back? Are you struggling with getting your horse engaged or is it experiencing back issues?If your saddle is too high off the horse’s withers or too low in the back, this will cause a lot of excess uneven pressure on the horse’s loins. It will not only put you in the wrong position, but it will be very difficult for your horse to engage as it will be unable to come through with its back and step underneath itself into a correctly engaged frame. Remove your saddle pad and irons. Place your saddle over the withers and slide it right back behind the shoulder blade. On a dressage saddle, the cantle should be a little higher than the pommel.Take a small round object (like a pencil) that will roll. Place it on the seat of the saddle and observe. If the saddle is balanced the pencil should rest in the center of the seat. If it rolls too far forward – the pommel is too low (cantle too high). If it rolls too far back, the saddle is too low in the cantle (pommel too high). It will be very difficult in either of these situations for both horse and rider to balance properly!The horse will be much more comfortable in a well balanced saddle, because the weight of the rider will be distributed over a larger area. The saddle will not be driven into the shoulder or back on the loin. With correct balance the rider will be able to use the 4 curves in her back as natural ‘shock absorbers’, and she will sit balanced on their seat bones. This good posture means she will be able to lean forward and backward without the lower or upper leg swinging back and forth. The “Balance” video is linked here. 2. Wither Clearance: Clearance at the withers should be 2-3 fingers for normal withers, whereas, mutton withers will have more clearance and high withers will have less clearance. Clearance should be all around, not just at the top. 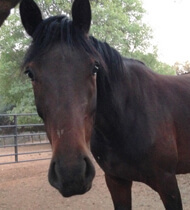 Is your horse reluctant to move forward? Are mysterious white hairs, strange bumps or soars appearing around the wither? Although you may have the required 2-3 fingers wither clearance, you may not have enough clearance on all sides, which is vital ! 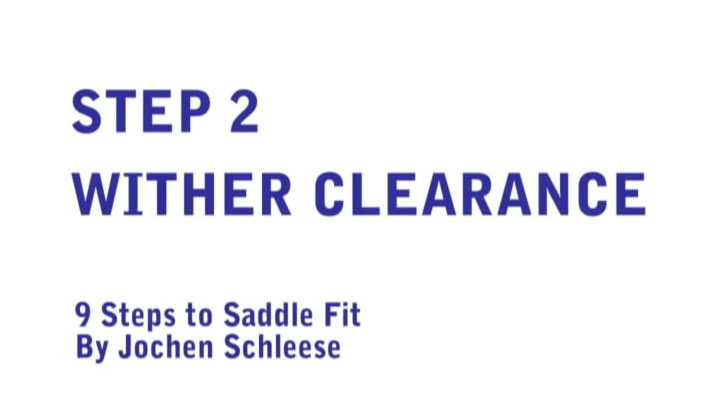 Watch this informative video for some saddle fit tips on “Wither Clearance” that may help you! 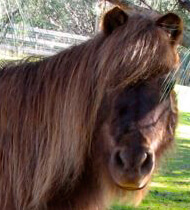 All of us are concerned that our saddles have adequate wither clearance and do not pinch our horse’s withers. But few of us truly understand exactly what “wither clearance” means. Many of us learned in Pony Club that our saddle should have 2-3 fingers clearance on the top of the withers. But we were never taught that there also had to be clearance on the sides of the withers. One of the reasons this is crucial is because when the horse moves, his shoulder blades rotate upwards and backwards. The saddle must have an opening (clearance) on the sides of his withers to accommodate the shoulder rotation. To see just how much your own horse’s shoulder blade rotates backwards when he moves, stand on the side of your horse and mark the shoulder blade with a piece of chalk. Then have a friend stretch your horse’s front leg forward and mark the new position of the shoulder blade. You will see how much farther back the shoulder blade is now positioned. Ideally, we should be able to get 2-3 fingers clearance on both the top and the sides of the withers. To determine adequate clearance on the sides of the withers, we measure from the point just above where the stuffing of the saddle starts. On a mutton-withered horse, however, we may get as much as 4-5 fingers clearance. If there is no clearance (or space) on the side of the withers, the horse’s movement will be restricted. It will be impossible for him to have free range of movement through his shoulders. The “Wither Clearance” Video is linked here. 3: Gullet Channel Width The gullet should be wide enough not to interfere with the spinal processes or musculature of the horse’s back (3-5 fingers). Is your horse reluctant to bend laterally? Is your horse not able to use its back correctly? 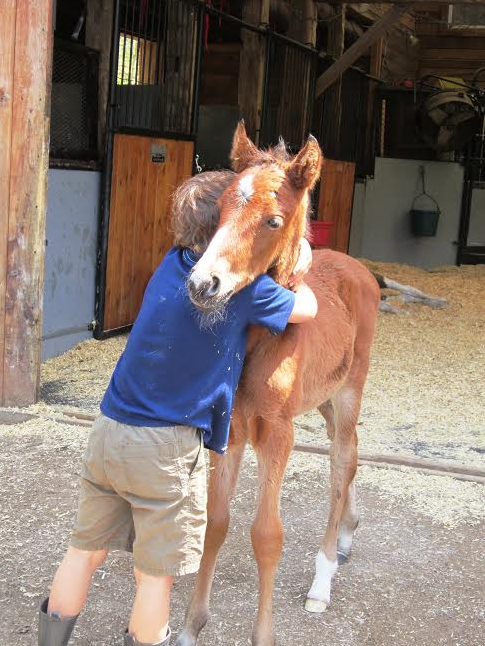 Are you needing to call out the equine chiropractor often? If you are answering “yes” to any of the above questions, you may be faced with a saddle Gullet Channel Width issue. A saddle with too narrow of a gullet channel can cause permanent damage to your horse’s back! 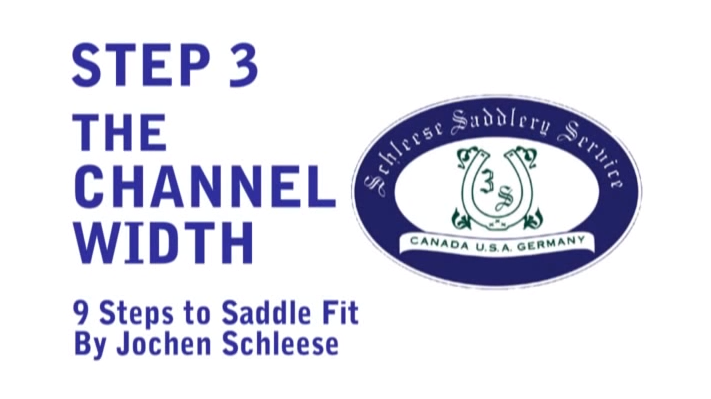 Watch this informative video and learn how to determine if your saddle’s gullet channel is the correct width for your horse. There is no one gullet channel width that is appropriate for every horse. 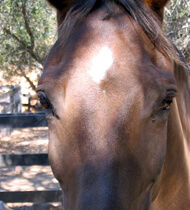 There is no such thing as “one size fits all” where the gullet channel of your horse’s saddle is concerned. 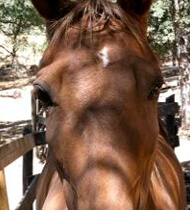 Instead, the width of each horse’s spine will determine how wide his saddle’s gullet channel must be. To calculate how wide your horse’s spine is, do the following. Stand on your horse’s left side and place your hands on his spine in the area where his saddle will sit. Then, with the tips of your fingers, gently palpate downward towards the ground. You will first feel bone (the transverse processes of the lumbar vertebrae), then a slight rigidity (the supraspinal ligament), and finally, an area where there is a bit more give. This is his back or longissimus dorci muscle. Mark the start of this muscle and then do the same thing on your horse’s right side. Next, take your right hand and make a bridge over your horse’s back from mark to mark. 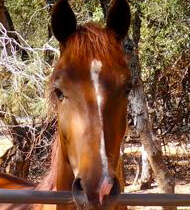 Put your left hand inside that “bridge.” The number of fingers you can get inside your bridged hand will determine how wide the gullet channel of this horse’s saddle must be. It is very important that the width of the gullet channel be the same throughout the entire length of the saddle. Too often we see saddles with gullet chanels that are the appropriate width at the front, but then progressively narrow towards the back. The result is a saddle that has a 4-5 finger gullet channel width under the pommel, but only 2-3 fingers at the cantle. If you consider the anatomical structure of the horse’s back, this makes no sense. The horse’s spine and surrounding ligaments do not get narrower over the length of his saddle-support area. As a result, in order to ensure adequate spinal clearance, neither should the gullet channel of his saddle. 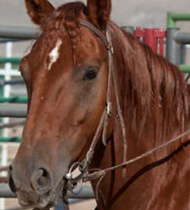 It is only infrequently that we find a saddle that is too wide through the gullet channel for a particular horse. But such a saddle will have inadequate weight-bearing surface, may start to strip muscle away from the top of the ribs, and the back of the tree may actually rest on the spine. 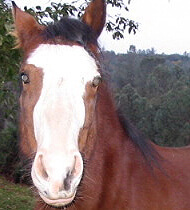 A much more common problem is a saddle with too narrow of a gullet channel. This saddle will sit on the horse’s spine and/or ligaments. This is especially noticeable when the horse goes around a corner: if the horse is tracking to the left, you will see the saddle shift to the right, so that the left-side panel rests on the horse’s spine/ligaments. This is something we must avoid at all costs. In the short-term, a saddle that sits on the horse’s spine/ligaments will cause him to tighten his back muscles and hollow his back, producing exactly the opposite of the nice rounded back that we want to see, particularly in dressage. In the long-term, a saddle with too narrow of a gullet channel will cause permanent, irreversible, and often career-ending injury or damage to the horse’s back. The most severe forms of such damage are spinal stenosis (compression and narrowing of the spinal canal) and spondylosis (degeneration of the vertebrae). Gullet Channel Width video is linked here. 4: Full Panel Contact The panel should touch the horse’s back evenly all the way from front to back; some panels may be designed off the back end to allow the back to come up during engagement. Is your horse reluctant to bring his back up? Are you worried that your saddle is creating pressure points? Once you’ve established that your saddle’s gullet/channel is the correct width for your horse, with the panels resting on your horse’s longissimus dorci muscles, and not on his spine or ligaments, you need to ensure that your saddle’s panels make even contact with your horse’s back. We want the saddle to sit on the optimal weight-bearing surface of the horse’s back, and to distribute the rider’s weight over an area that equals approximately 220 square inches. It is important that the saddle not bridge or rock. 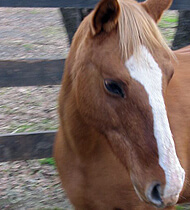 When a saddle bridges, the front and rear of the panels make contact with the horse’s back, but the middle does not. (For a visual image, think of an arch bridge.) When the rider’s weight is in the saddle, this results in excessive pressure at the front and back of the saddle. To determine if your saddle bridges, place your saddle on your horse’s back without a saddle pad. Stand on your horse’s left side and place your left hand on the pommel and the finger tips of your right hand between the panel and your horse’s back, under the area where the stirrup bar is. Move your right hand slowly toward the back of the saddle, feeling for any areas where the panel does not make contact with your horse’s back. Then do the same on your horse’s right side. Or, rather than using your hand, some people find it easier to test for even contact by sliding a pen or pencil in between the panel and their horse’s back. Use whichever method works best for you. 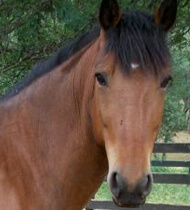 When a saddle rocks, the panels at the front and/or back of the saddle do not make even contact with the horse’s back. Think of the motion of a rocking horse. In this case, there is excessive pressure in the middle of the saddle, and the rider’s entire weight is concentrated in this one area. 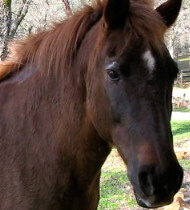 To determine if your saddle rocks, place the saddle on your horse’s back without a saddle pad. Push down on the pommel. If the cantle lifts up off the horse’s back, your saddle rocks. Note that sometimes your saddle may be made with panels that deliberately flare up at the very back, so the last inch or so of the panels don’t make contact with your horse’s back. 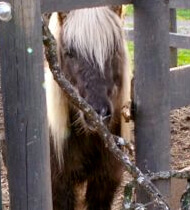 This is done in specialized cases: for instance, when there is a need to accommodate a tall or large rider on a horse with a short saddle-support area. If fitted correctly, this saddle will not rock. Sometimes we hear that a saddle that bridges slightly is actually a good thing, because when the horse lifts his back as he is being ridden,his back will come up into and fill in the space left by the bridge. While this may seem logical at first, in reality, it doesn’t work. The reasoning here is faulty. To demonstrate this, the next time your Saddle Fit technician or Saddle Fit Representative fits your saddle, ask her/him to put the Arc device or Saddletech (the metal tool used to measure the curvature and width of your horse’s back) on your horse with the middle two wings lifted so that they do not make contact with your horse’s back. This will simulate a saddle that bridges. Then scratch your horse’s stomach along his midline, so that he raises his back. You will see that the middle 2 wings of the Arc device still do not make contact with your horse’s back. This shows that even when your horse lifts his back while being ridden, his saddle will still bridge. Full Panel Contact Video is linked here. For the Bucket Fund Babies! 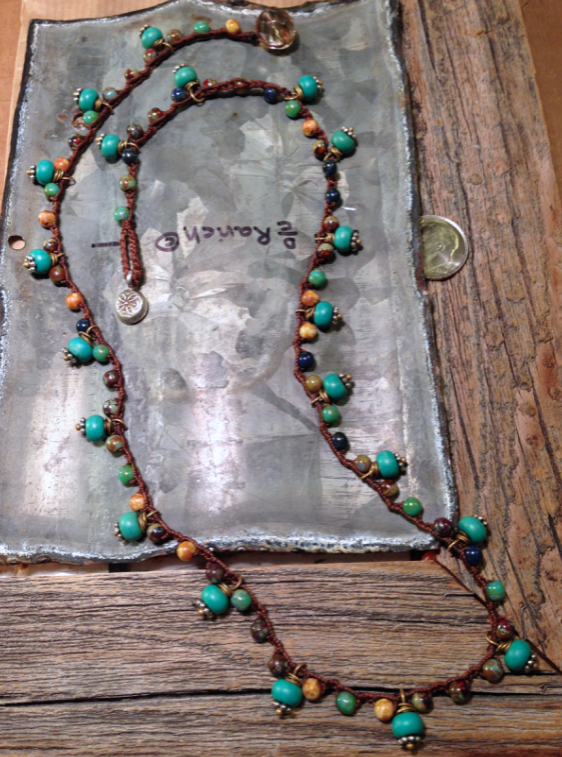 Moroccan Inspired Dangly Turquoise and yummy Specialized Czech glass bead Necklace/Bracelet! $68!! 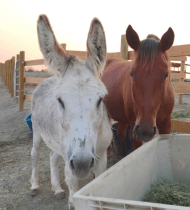 MARCH BUCKET FUND RECIPIENTS ARE THE NURSEMARE FOALS AT LAST CHANCE CORRAL! Let’s help them save as many of these babies as possible! Click here or image!